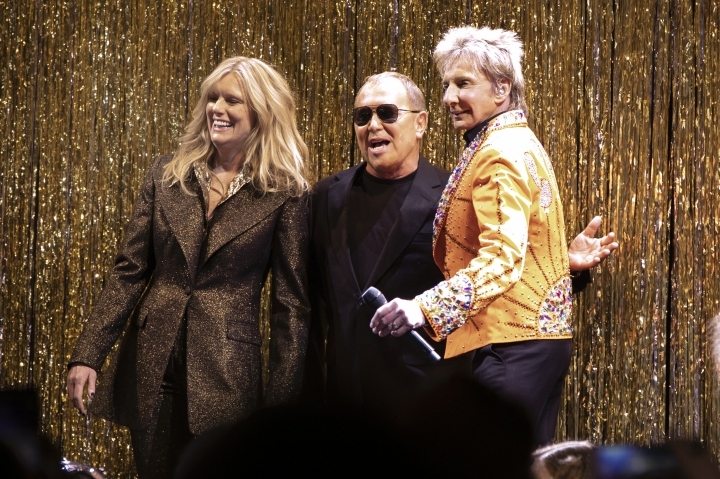 Manilow, a surprise guest at Kors' '70s runway bash, belted his hit "Copacabana" from a glitzy stage set up near the catwalk as Bella Hadid danced beside him and rock muse Patti Hansen (married to Keith Richards) hopped up for a quick kiss after walking for Kors, an old friend. Backstage after the show, Kors said he had met Manilow at a concert a year ago and invited him on board. The pop king had never been to a fashion show before, Kors said, calling Manilow the "cherry on the cake." 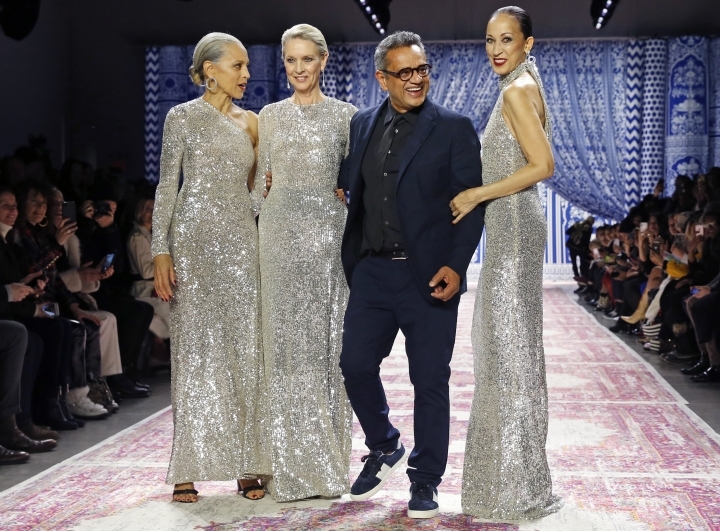 The grand finale of designer Naeem Khan's runway show featured three models, all over age 60, walking the runway in silver sequined gowns. Karen Bjornson, Alva Chinn and Pat Cleveland were known for working with Halston in the 1970s and were part of a group known as the Halstonettes. Khan was an apprentice under Halston earlier in his career. But it wasn't the age of these models that was impressive, it was their attitude. These three had such confidence, pizazz and style that audience members were standing, applauding and whooping with joy. These models brought down the house. And then there was famed '90s supermodel Christy Turlington — heck, she's one of the women they coined the phrase for — stunning the fashion world by turning up to walk the Marc Jacobs runway in a voluminous black feathered gown and matching fascinator, closing out New York Fashion Week with an emotional bang. Taking to Instagram later, Turlington explained that she had turned 50 earlier in the year and "have arrived at a place where 'why the ... not' is the answer that comes up when I ask myself questions." And she said she has "a 15-year-old daughter who I desperately want to see and hear me, and this is a medium that 'speaks' to her." Her appearance came as Jacobs put on one of his best shows in years, filling the runway with high drama and fairytale whimsy. In a week that focuses on appearance, it was refreshing to see a moment of pure tenderness. Brandon Maxwell dedicated his show to his mother, Pam Woolley, who's been battling breast cancer, and to other strong women everywhere. At the end, the designer escorted her down the runway for a final bow, kissing the side of her head as she wiped away tears. Maxwell called the show "the physical manifestation of, I think, the strength that I saw her display over the past few months." The Badgley Mischka show featured sleek, fitted dresses with stretch, in sequined metallic, black and green. But the end of the show was a vision in red, when all the models stormed the runway at once, in short dresses made of various fabrics, including lace, velvet and feathers — all in the same shade of crimson. Usually models remain stone faced when strutting the runway, but this finale had models smiling and clapping and clearly enjoying the hoots and applause from the enthusiastic crowd. This story has corrected spelling of Mischka.